There are a lot of pieces of art in the sphere of Walt Disney World marketing, concept art, merchandising, and the like. 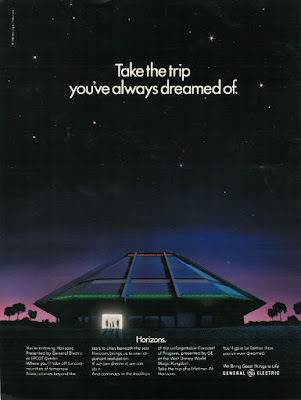 I don’t know of a single piece, however, that evokes as much emotion in me as this advertisement for Horizons. In the text alone there is a perfect time capsule of what Horizons was about and how it continued the traditions forward from the Carousel of Progress. It even reminds guests that it was General Electric who brought the dreams of tomorrow to us. If you read through the entire one sheet you are doing better than I am, because my eyes always settle directly on the dusk-shrouded building of Horizons. Whether meant to evoke a brighter tomorrow just beyond those doors or a spacecraft preparing for launch, or just having landed, seeing the outline of Horizons is enough to make my heart skip a beat. From the simplicity of the green and red lights, to the portal to tomorrow that seems to be just mere steps away, this piece of marketing completely personifies everything I loved about this attraction. What about you, is this just another advertisement that wouldn’t have garnered much attention from you or is it something that you love as well? Is there another piece focusing on Horizons that calls out to you more? And what is it trying to tell us, is it a spaceship or the path to tomorrow? That’s the wonderful thing about Horizons, it could be whatever it needed to be to every person who experienced it!